William Shakespeare penned the romantic but ultimately tragic tale of Romeo & Juliet in 1597 and it’s only taken a little more than four hundred years for these characters to make it onto the spinning reels; this online slot is designed by Blueprint Gaming and it comes with a progressive jackpot of which the bard himself would have approved. Romeo & Juliet is a five reel slot with three rows and twenty fixed paylines; there’s a gentle piano soundtrack to the action which takes place on golden reels against a backdrop of an arched building at dusk. The high value symbols are the game’s logo (which can appears stacked anywhere), the family crest, a fluttering dove and a red rose; 10, J, Q, K and A represent the lower values. The symbol with Romeo & Juliet is wild and it will substitute for all others to form winning combinations except for the poison bonus icon. Five Of A Kind – an instant five of a kind win. Bonus Activation – kicks off one of the Poison Bonuses listed below. Romeo/Juliet Wilds – extra wilds added to the reels. Lovers Winspin – a free respin. Romeo’s Mystery Win – pick from three shields to find Juliet and win cash – finding ‘Collect’ will end the round. Juliet’s Mystery Wheel – spin the Wheel of Fortune to pick up prizes and move towards the centre, avoiding ‘Collect’ which will end the round. Star Crossed Lovers Free Spins – five free spins on two sets of reels in which hearts are added as wild symbols. 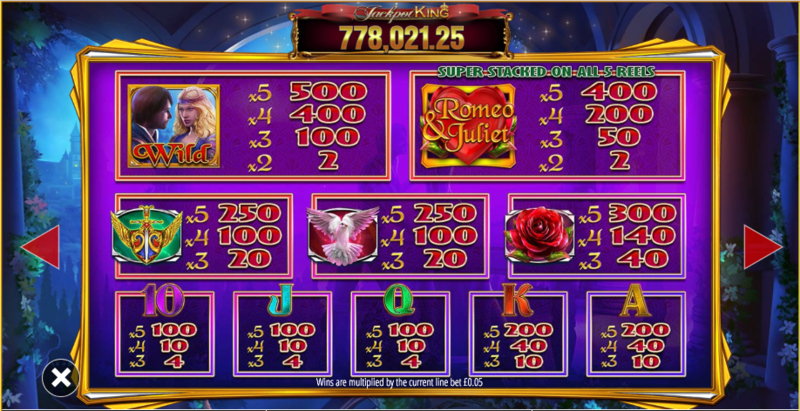 Romeo & Juliet is part of Blueprint Gaming’s Jackpot King progressive jackpot series and the feature is triggered by landing five jackpot symbols on the reels. 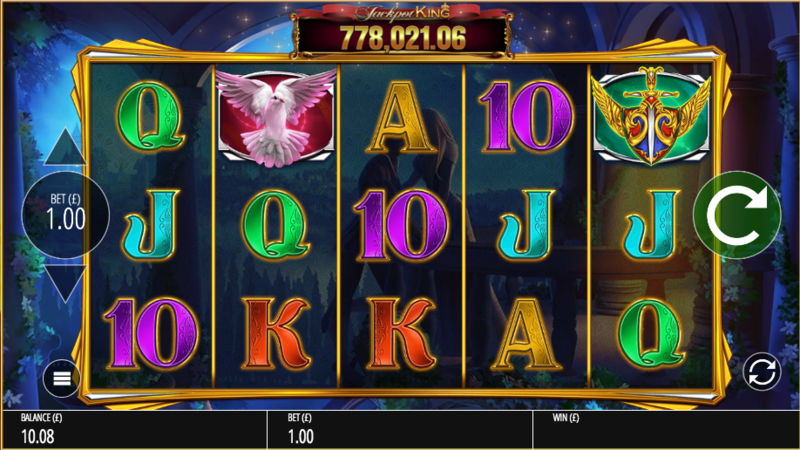 You’ll then play a reel set where the aim is to collect crowns before the round ends – manage at least 15 and you’ll get to spin the wheel of fortune which could win you the progressive jackpot. Romeo & Juliet takes a bit of working out in terms of the various features but once it’s all worked out it’s not too shabby; the Lovers Super Spin hits regularly to help you out but it’s a bit trickier to land the main Poison Bonus. This game has an RTP of 92.59%.